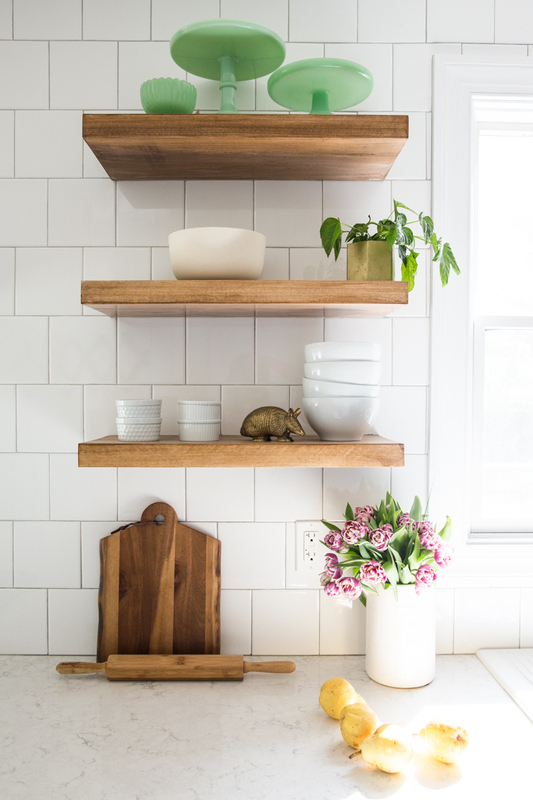 When I designed our kitchen remodel, I knew right away I wanted beautiful, wooden floating shelves. 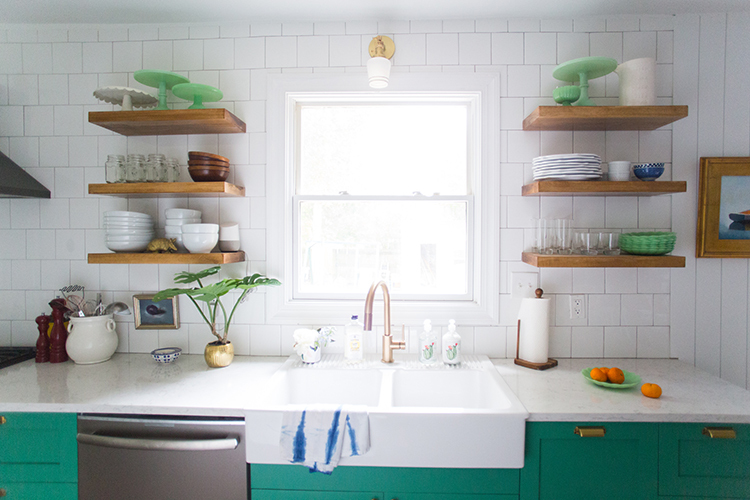 Not shelves with brackets, but true floating shelves coming straight out from the tiled backsplash wall. It was tricky to find exactly what I was looking for in the stain and length that I wanted, so I did what any self-respecting DIY-er would do and made them myself. I have had a lot of interest and requests for this DIY, and I am excited to share. I also want to begin by confessing that this is not a beginner project, and may utilizing more skills, and tools, than the average crafter may have. I employed the help of one of my carpenters for his table saw (in Texas I would have borrowed from a friend), and there are definitely other ways to make this happen. But, if after reading through you decide a DIY isn’t your best option, these reclaimed pine shelves are lovely and probably the closest to what I wanted. Our kitchen is narrow and long. In order to keep the upper part of the room visually wide, I chose open shelving for daily dishes, decorative cake stands, and a couple little plant babies. I have had open shelves in every house we have lived in, and I absolutely love them. I use the dishes frequently enough things don’t get dusty. Our ventilation system for the stove is great, so I don’t notice grease and grime on the dishes. And we have sufficient cupboard and drawer storage that anything I don’t want out has a place tucked away, so the floating shelves get to be a display place for styled and beautiful items. They really add to the overall look of the kitchen. Lumber, at least 1″ thick and in the desired width. Cut it to the desired length for each shelf. Floating Shelf Brackets, heavy duty enough to hold the weight of dishes and cookware. These are the ones I bought and used for our kitchen and they have been amazing. These are good for shelves between 24″-48″. Any longer and you would use more than one. 13/16″ or 2omm paddle drill bit with an electric drill, for drilling the holes for the steel rods. Palm Sander with sandpaper, to smooth out the wood and cuts before staining and sealing. 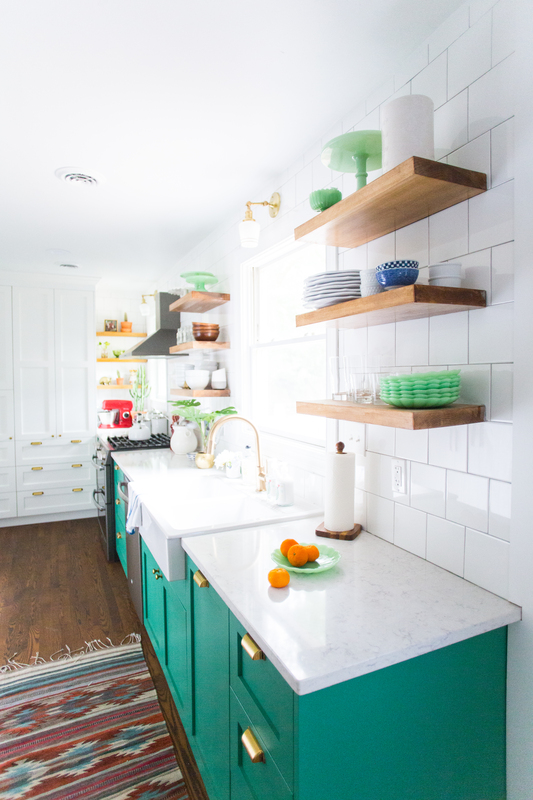 Determine the length and depth of shelves you want. I chose 24″ shelves with a depth of 11″ for our kitchen. 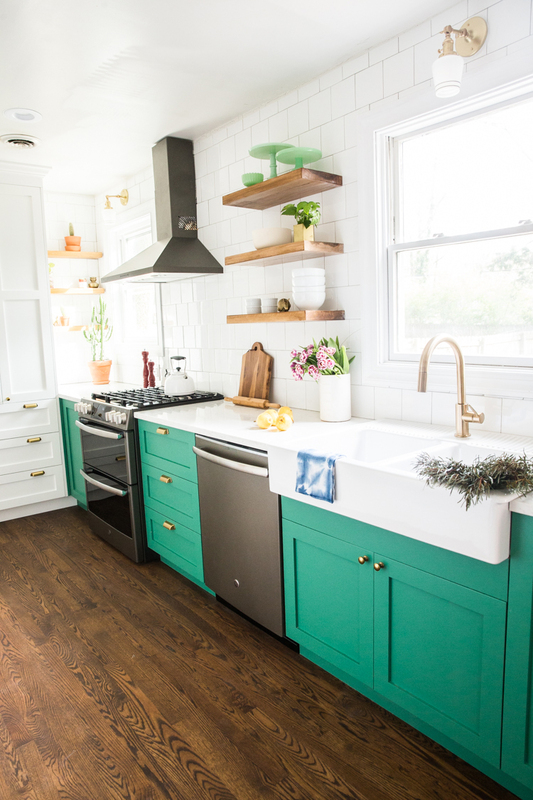 The 24″ fit well between the window and the range hood, and I knew I needed at least 10″ deep for my plates and cups to fit well. 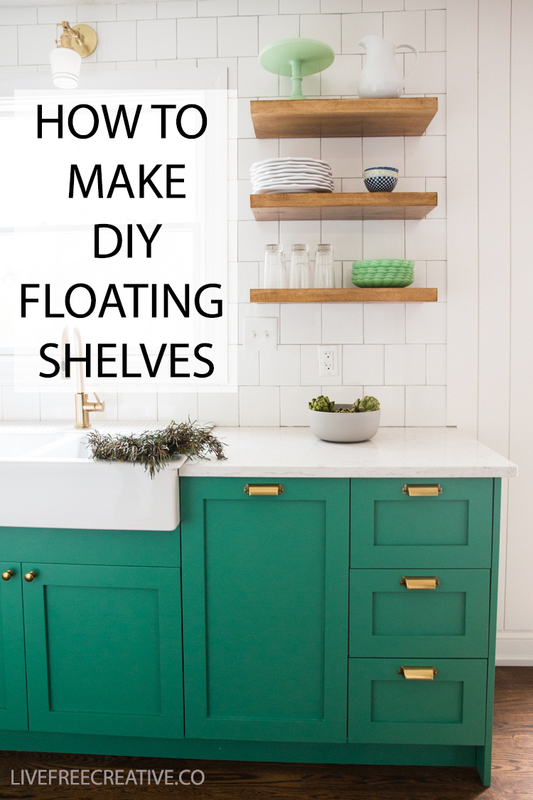 The shelf depth is one of the reasons I chose to make my own, because most floating shelves I found online maxed out around 8″ deep, which just wasn’t deep enough to be practical. I was able to find 2x12x10 lumber at a specialty lumber store locally. Big box hardware stores (as much I love them) don’t have the same variety and types of wood as a specialty store. I chose poplar, which was hard enough to wear well, but not quite as dark or expensive as walnut or cherry. I loved the idea that I could mix and add my own stain to the lighter wood, making it whatever I wanted. I had my carpenter cut the lumber into 6 24″ pieces using his table saw. I could have used a circular saw and saw horses, but since I had access to a carpenter at the time, I asked for his help. The brackets each have 2 six-inch steel rods, spaced apart. Measure the distance on center between the two, then mark with a pencil. 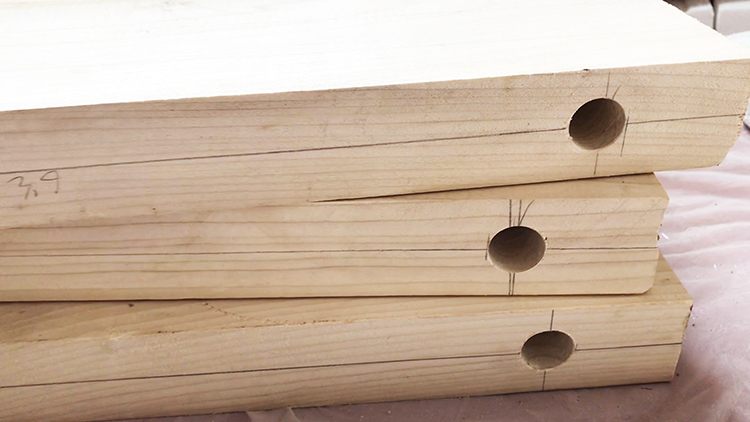 Use your 20mm paddle drill bit to drill straight down into each bracket to a depth of at least 6.5″. If you have access to a drill press, that would work well, too! The holes need to be close to exact, so the shelves can slide right onto the rods once the brackets are installed onto the wall. We had some trouble with one of the nine we did, and I ended up drilling the hole on one side to about 1″ wide and 7″ deep so the rod would fit. Once I troubleshot it that way, it worked beautifully! Use a fine grit sandpaper to smooth all of the sides and edges of the shelves. The smoother, the better. I like using a palm sander, to make the process go a bit more quickly. Sanding can be super messy, so make sure you are outside, or in a garage or workspace, because you will end up with sawdust all over the place by the time you finish. Once the shelves are all smooth and sanded, wipe them clean with a tack cloth to prepare to stain them. I used a combination of 1 part Mission Oak to 2 parts Pecan stain for the perfect warm-but-not-too-orange wood stain color. My poplar wood had a pale green sheen when I began, so the warmth of the pecan and the darkness of the walnut balanced it nicely. 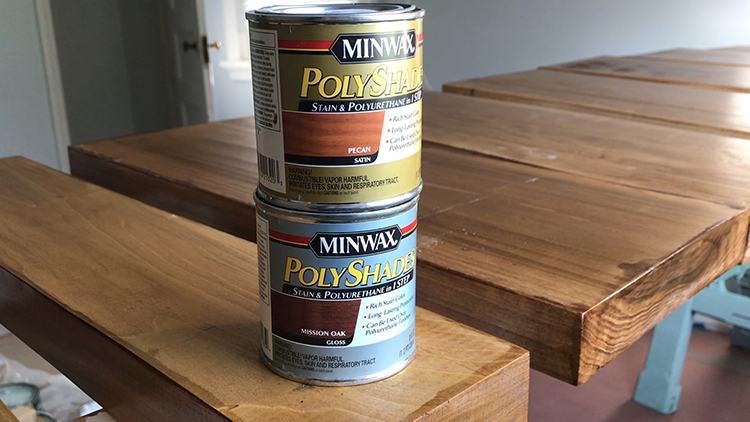 Your own stain color will depend on your preference and the type of wood you begin with! I brushed the stain onto the edges and one side, let it dry, then flipped them and stained the opposite side. I did about three coats before they looked finished. The brackets need to be either installed into studs, or anchored with some serious drywall anchors. I positioned mine so that at least one of the sides went into a stud, then we anchored the other side. If you have a chance during a remodel to block out exactly where you want them to go, that is ideal. If you are only planning to style them with decorations, and don’t need to have them stable up to the 150 pound weight limit, you may be okay into drywall with anchors only. 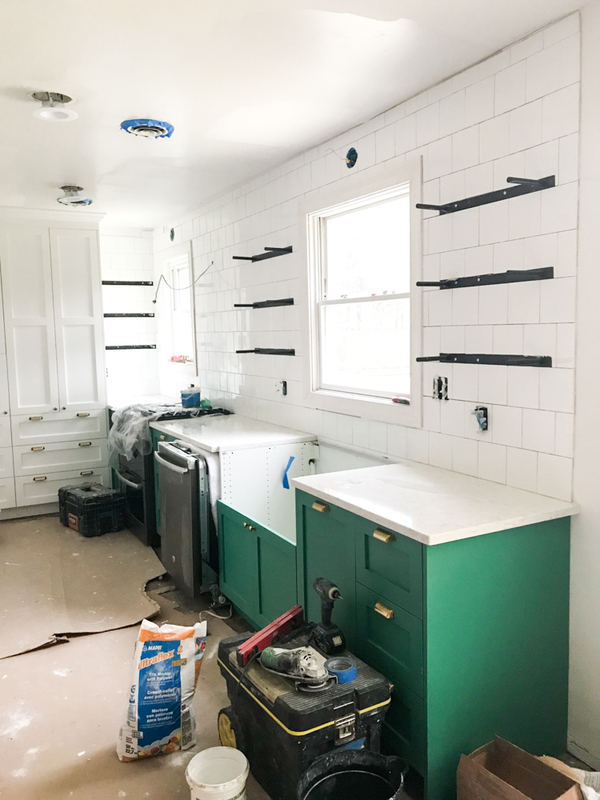 The brackets are about 1/4″ thick, so in order for my shelves to sit flush against the tile backsplash, we installed them inline with the tile itself. The depth of the bracket and the depth of the ceramic tile were the same, so when I slid the lumber shelf onto the bracket, it sat flush on the wall. If you are installing the bracket straight onto a wall, and want the shelf to sit flush the best idea is probably to route out the back of the lumber by 1/4″. You could use a router saw or a chisel. Alternately, you could sink the bracket into the drywall by 1/4″. You may not mind the 1/4″ of space between the wood and the wall, and a little caulk would seal it off as well. So, you have options! Once the brackets are in place on the wall, simply slide the stained shelves in place. You will want to test the shelves on their corresponding brackets before anchoring the brackets to the wall, to make sure that you can get the shelf on easily. So, when the bracket is up, you can slide each shelf onto the rods. These brackets don’t come with any way to secure the shelf once they are installed, and rely on the depth of those rods into the wood for the stability. We are using our shelves for heavy dishes and kitchen wear, and haven’t had anything budge at all! When all of the shelves are installed onto the brackets, finish the back edge with bit of caulk, if you want. 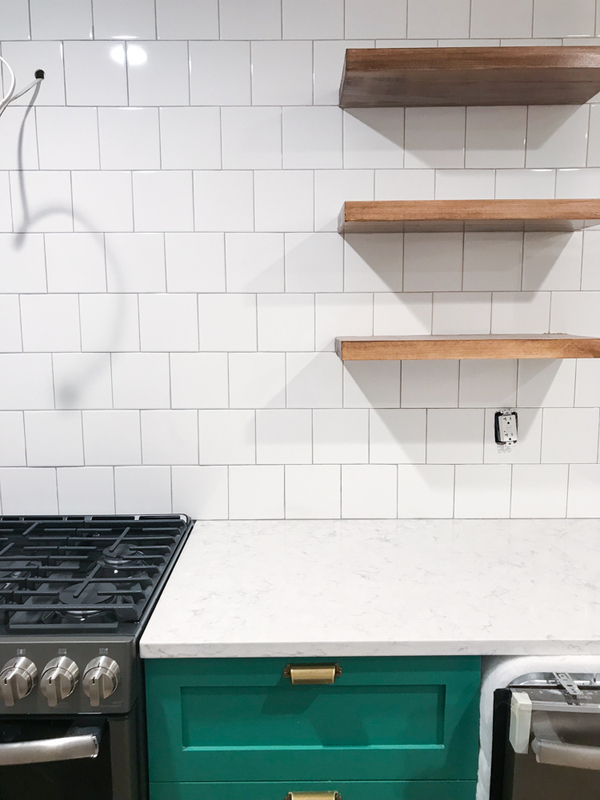 We used white kitchen caulk to match the ceramic tile backsplash.You could also use a clear caulk, just to finish everything off. Your shelves are up! Now the fun part, styling them. I like to being with one or two big things, then go back in and full in with interesting items, colors, or accents. 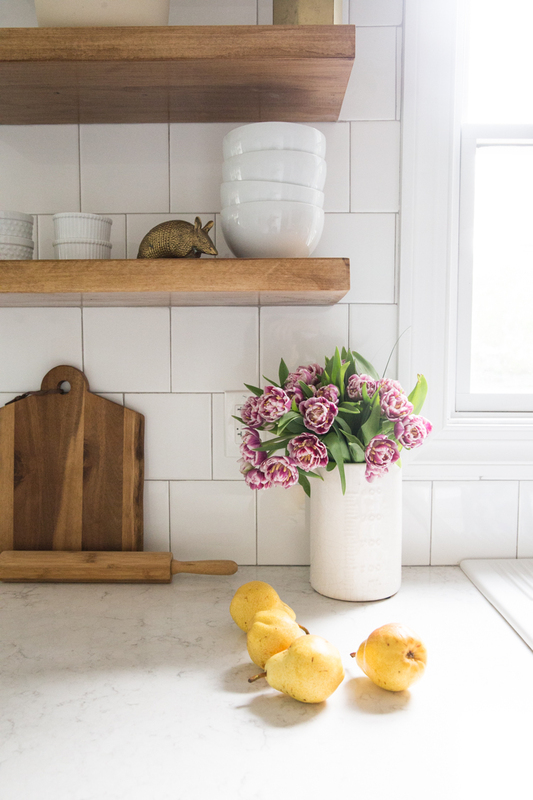 If you are styling kitchen shelving, make sure you put things where they make sense for the flow of the kitchen. We have glasses next to the sink where we use them all the time, and the pretty cake plates on the highest shelves where they don’t need to be reached as often. Try to back up and take a picture with your phone to see the styling better than you can with your own eyes, then balance it and tweak as needed. Now look how fancy! 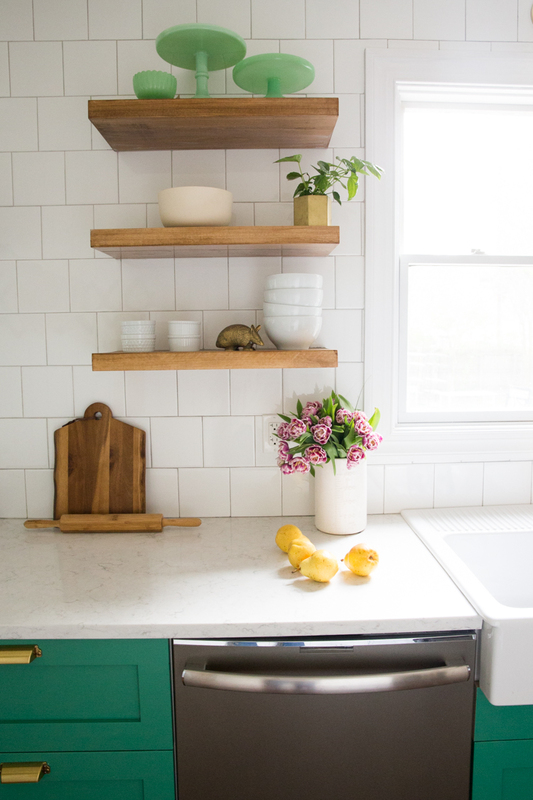 These DIY floating shelves are one of my favorite elements of our new kitchen, and I am thrilled with how they turned out. It is worth the work, energy, and effort to make things the way you imagine them, and these shelves turned out exactly as planned. The total cost for the nine shelves was around $450, or about $50 each. Not bad considering similar custom shelving can run into $200-300 per shelf. I hope you got a good feel for this project, and wish you luck in completing your own floating shelves!